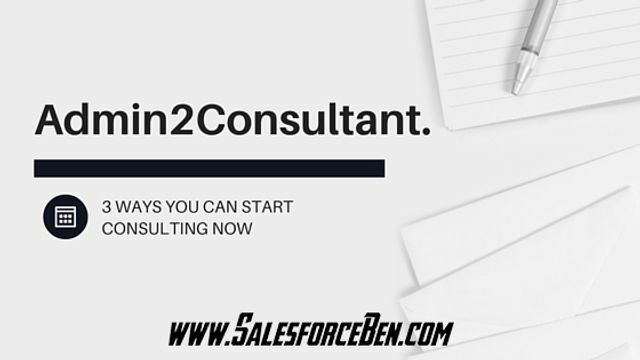 How to start Consulting Now! Another excellent post from Ben. I must confess I have candidates who come to me for advice on how (when they currently work at an end user) they can move into a consultancy where they see a longer term career plan. These are perfect steps to take to raise your employability. Over the past few years of speaking to people from various industries and backgrounds, the story that usually crops up when asked how they got into Salesforce is..”My boss told me to learn it and now here I am!”. Once people seem to understand the power, scope and all around career potential of the Salesforce platform they start to look for another job. Consulting is a logical career step for Admins as they can use their problem solving, solution building and people skills to help multiple businesses across various industries, and are usually compensated more for this.